It's easy to forget that I have a blender. Most of the time it hangs out in the pantry...out of sight and out of mind. With summer in full swing, my blender should have a place of honor on the kitchen counter, cranking out cold drinks every day of the week. 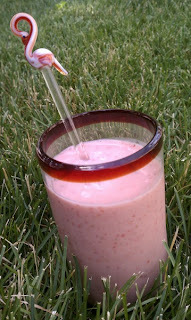 If you'd like to enjoy the simple pleasure of an easy fruit smoothie, open your fridge: do you have yogurt? do you have fruit? do you have ice? Yes? You are ready to go! Do you have tropical stir sticks? No. Don't worry. I brought this flamingo (and it's cousins, including an iguana and a cockatoo) back from Playa del Carmen a few years ago. Not a requirement, but certainly a fun accessory. Put all ingredients in the blender and blend until the ice has been crushed and your drink is smooth.